SDA Seminary professor and theological historian Dr. Martin Hanna summarizes the guiding principles of the Spirit of Prophecy regarding women in ministry. 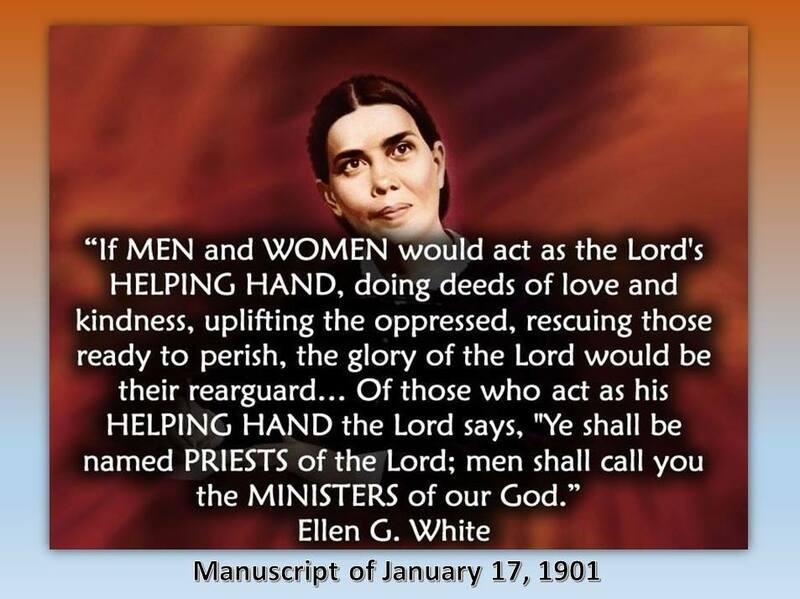 Ellen White wrote a lot of positive things affirming women in ministry. For example, “There are women who should labor in the gospel ministry.” (Manuscript 43a, 1898). “It is not always men who are best adapted to the successful management of a church.” (Pastoral Ministry, p. 36). The Holy Spirit “prepares workers, both men and women, to become pastors.” (Testimonies Vol. 6, p. 322) “Make no mistake in neglecting to correct the error of giving ministers less [salary] than they should receive…. The tithe should go to those who labor in word and doctrine, be they men or women.” (M.R. 1:263) Ellen White was listed as an ordained minister in the SDA Yearbook beginning in 1884, and was paid the salary of an ordained pastor from 1881 forward. Ellen White said, “The refining, softening influence of Christian women is needed in the great work of preaching the truth.” (Review and Herald, Jan. 2, 1879) She wrote to the Elders of Battle Creek on her authority in the sacred pulpit: “. . . neither the Lord nor Sister White will need to be dictated to by the brethren as to what subject she will bring before them [from the pulpit]. I … ask not permission to take the desk in the tabernacle. I take it as my rightful position accorded me of God.” (EGW Manuscript 30, June 1889, in 1888 Materials, pp. 355-356) For more quotations, see this collection. Posted in EGW, Ellen White, Spirit of Prophecy, Videos.